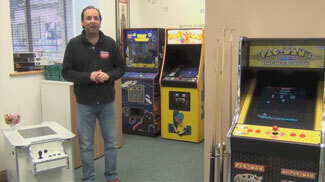 Brand new multigame arcade machines, with all the great retro classics. Handmade in the UK to the highest standard. Lowest prices guaranteed, free delivery, backed by award winning service. Here at Home Leisure Direct, we are passionate about retro gaming, and reliving the classic arcade games of the past. Our range of multigame arcade machines hold a selection of classic arcade games in each cabinet, allowing you to play a whole variety of retro arcade games on one machine. These machines are all of great quality, made by craftsmen to exceptional standards. There are a variety of designs, including the always-popular Cocktail design, which allows you to sit and play retro arcade games, while resting your drinks and snacks on the side, reminiscent of the original machines that began to replace tables in pubs in the 1980s. Upright models feature the classic design we all think of lined up in arcades, but often manufactured to be more slimline to fit easily into modern living spaces. Our incredible ArcadePro range offers Cocktail and Upright machines, as well as other arcade machines to fit any niche and satisfy any gamer. From the Mercury TV console which will fit under any modern television, all the way up to the incredible power and games variety of the Saturn and Jupiter arcade machines, you're bound to find something to fulfill your gaming needs. We've seen a huge rise in demand for these retro arcade machines in recent years as retro and vintage products have become highly sought after. Consumers want to re-live the excitement and wonder of the early days of the computer game industry, that all started 55 years ago when a bored programmer invented the first computer game Tennis For Two. Little was he to know that it would kick-start an international gaming culture that would mushroom out into a billion dollar industry over the next few decades. Part of the attraction to the games is that their rules and aims are so simple that anyone can play, and they are great fun for all ages. Whether playing them for nostalgic reasons, or discovering them for the first time, they are still as enjoyable and as addictive as ever. Depending on which model you select, you can choose between one or two player cabinets, coin-op or freeplay, and select from a range of games packages and cabinet finishes, including custom decals. These impressive multiplay machines come with a fantastic variety of the best remembered and best loved original arcade games from many eras, such as Centipede, Donkey Kong, Donkey Kong Jr., Frogger, Galaga, Pacman, Ms. Pacman, and Space Invaders, to name but a few. For a full list of games, take a look at the individual product listings of each model. Certain customisations are available, so if you have a particular game or transfer design in mind, get in contact with us and we’ll try our best to work with the manufacturers to cater to your needs. Our range is constantly growing, however we are dedicated to only selling quality machines that are built to our standards and pass our quality assurance checks. The retro arcade machines we are proud to list include ArcadePro, GamePro, Namco, Bespoke Arcades and more. All of our retro arcade machines are quality tested and suitable for the UK market. They have all passed the relevant safety checks for retro arcade machines of this type. For further advice on our retro arcade range, please call us free on 0800 622 6464 and speak to a member of our expert team who will be able to answer any questions you might have.